This report is accompanied by some photos I have taken. There are not many, as the women only rarely agree to having their picture taken; moreover, the stay there is stressful, as it is. 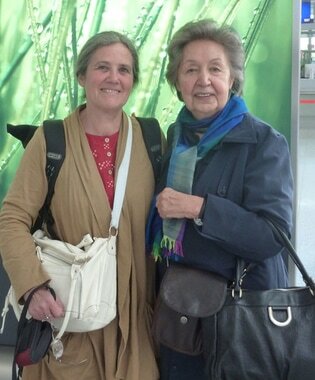 Shaima Breshna accompanied me, an elegant Afghan woman living in Germany. She has initiated the project Azezana, which she is currently leading: In Kabul, a group of women are dying silk threads to make scarves. Shaima is twenty years older than me, I admire her energy and determination. I wonder: What will my energy for the embroidery project be like in 2036? Be sure to visit her Azezana website which offers a beautiful view of all these vibrant colourful silk scarves. The silk is mostly dyed with natural dyes and comes from Herat. was raw rhubarb in salad. This is called salota and is made from a basis of tomatoes, cucumbers and fresh onions cut into very small cubes, served with fresh spices, finely shredded mint, coriander and salt but never with oil. The variety I discovered contained very small pieces of raw rhubarb, whose light tartness adds welcome freshness in the great heat of beginning summer. I noticed that, eating from the common bowl, some people put the rhubarb meticulously aside, while others, among them also children, were happy to pick just these out, all the while making faces. of Shomali. Shomali means “wind”, making it obvious that it is windy place. On my first evening in the village where I spend my nights after the threats earlier this year, the wind turned so stormy that the pomegranate trees lost all their flowers. Even worse, the fruits of the mulberry trees (tut) that were just ripe were scattered on the ground, lost for the harvest. 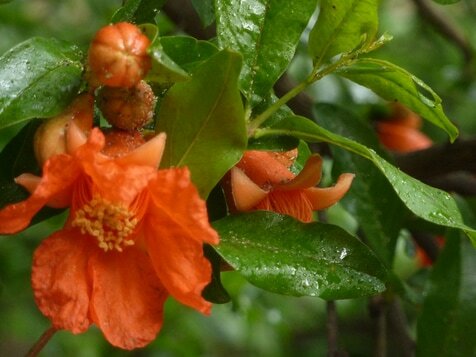 This means a severe loss for the population, who eat this fruit and sell it – in fresh and dried form. 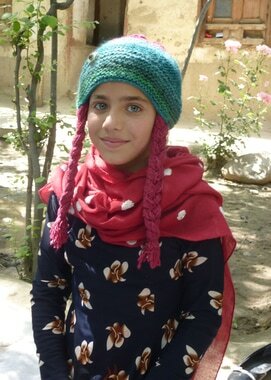 who has already taught the women in the villages twice how to knit, has found more followers, among them a young girl, Nilufar, who has knitted several pieces of clothing for her dolls, a tunic for herself, as well as this very modern cap, which she put on in spite of the heat to be photographed. When I met her last winter, she had stopped going to school because she did not like it and preferred knitting. So I tried to convince her that being able to read and write is much more important than knitting and she would still have enough time for that, anyway. So I gave her a considerable quantity of wool and we made a deal: Lots of wool in return for the promise to return to school at the start of the new school year (21st of March). She has kept her promise. 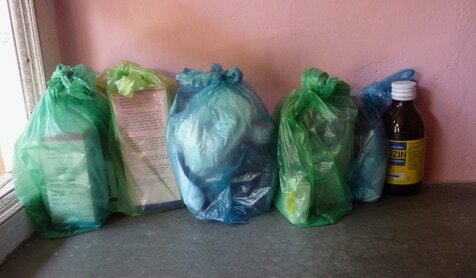 take turns ­visiting the villages. 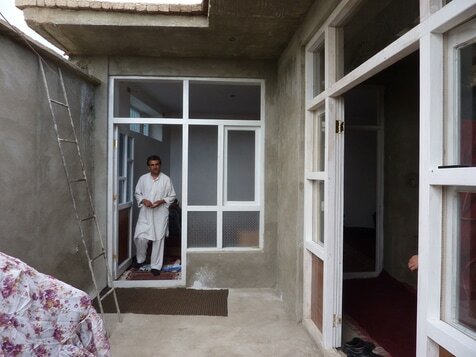 In 2014, we asked for financial support in the rebuilding of Omeda’s house that had become derelict. Towards the end of the construction work towards the end of winter, Omeda and her children took up living there again. In the back, the picture shows Khaled, leader of the project, without whom nothing would happen. Khaled is one of those people that one would wish to find more often in Afghanistan. Then there would be no more war and the country would flourish again. 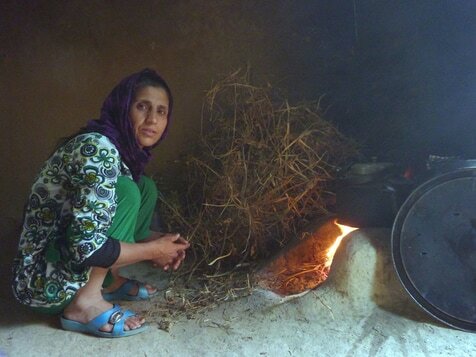 cooking is always done over wood fire (brushwood or cow dung) in the morning to heat water for tea and to fry eggs. The more important meals at noon and in the evening (rice, pulse, vegetables – only rarely with meat) are cooked over gas bottles. These have become much safer now, after having caused many explosions and killing many women. Pita bread (nan) is daily baked in a traditional underground oven (tandoori). 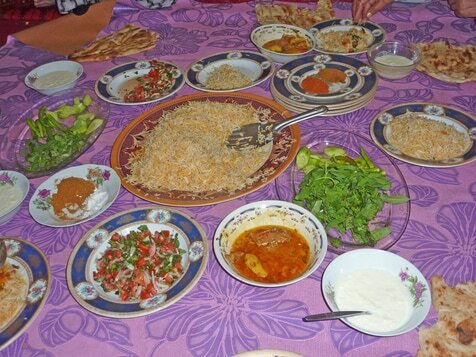 While in Germany and the rest of Europe tomatoes are just now planted after the Frost Saints, over in the plains of Shomali one can already eat tomatoes, cucumbers, onions and zucchini. 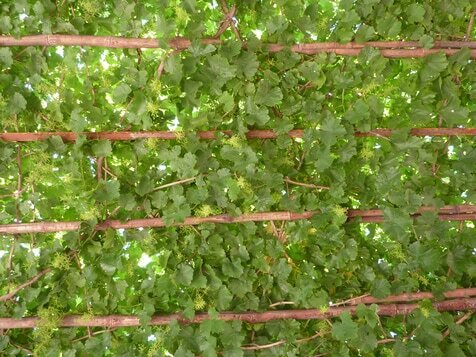 Grapes have already appeared, the vines offering welcome shade from the sun. 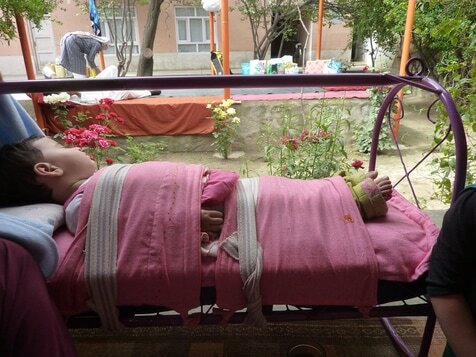 of taking a picture when I find a baby trussed up in a crib. These babies cannot move in any way, completely wrapped in two broad pieces of cloth and strapped down by two narrower bands. For the night, the baby’s arms and legs are also wrapped up like a mummy. As a mother of four and a grandmother as well, I find it hard to imagine the purpose behind this deliberate confinement, but they seem to feel comfortable.